Riad Mena is a serene and spacious 600sq m Riad situated in the heart of the Medina, just seven minutes walk through picturesque alleyways to Marrakech´s main-square, the Jemaa el Fna. A two-location hotel concept in and around Marrakech. Riad Mena is a serene and spacious 600sq m Riad situated in the heart of the Medina, just seven minutes walk through picturesque alleyways to Marrakech´s main-square, the Jemaa el Fna. Initially conceived as a private home, the personal touches throughout have created a wonderfully unique hotel experience in Marrakech. With six spacious bedroom suites surrounding the plant filled courtyards, Riad Mena makes for a private and very memorable stay. Just forty-five minutes away in the Ourika Valley is the Riad Mena & Beyond country outpost, a two-acre permaculture farm situated at the foot of the Atlas Mountains. Whilst Riad Mena is the luxurious, creative city-stay, capturing the inspiring and international essence of Marrakech, the farm is the counterbalance to this, allowing guests to spend the day or some nights away from the bustle of the city. Simple yet beautiful accommodation, a twenty meter natural pool to swim in whilst surrounded by incredible views of the Atlas Mountains, yoga on the terrace with our visiting practitioners and freshly prepared seasonal picnics eaten amongst the hundreds of olive trees, all come together to create a wonderfully grounding and peaceful experience, such a short trip from Marrakech. 8m outdoor heated pool, Hammam, film screenings on the terrace, honesty kitchen allowing guests to help themselves to drinks and snacks. Philip Starcke bathrooms, 600 thread-count sheets, locally made organic bathroom products, travel adaptors, hairdryer, bathrobes and toiletries. We have collaborated with visiting international therapists and teachers throughout the year for a full body and mind holiday. We have always believed that your body knows what is best for you and with this in mind have created bespoke retreats. Whether it´s a massage and a drop in yoga class to a week-long raw food detox or classes in mindfulness, our retreats are personalized to your needs. Half-day tours of the most interesting sides of Marrakech, be it on the burgeoning contemporary art scene, vintage book finding, photography and interior decoration courses, or simply where to find the best carpet in town. Riad Mena´s team has been with the house from the start and are a great part of the personal and familial atmosphere that makes Riad Mena so special. Speaking both French and English they will cater to your every need, whilst our cook fills everyone’s stomachs with joy and delicious food. 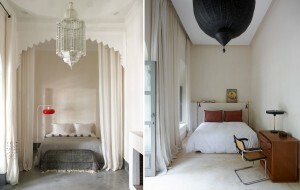 Forty-five minutes outside of Marrakech, at the foot of the Atlas Mountains is the Riad Mena & Beyond outpost. A fully-functioning permaculture farm where guests can come to spend the day in wonderful nature, enjoy a seasonal picnic, or even spend some nights in the rustically charming houses. A 20m natural pool with views of the Atlas Mountains, a roof terrace for even more mountain views, all set amongst two hectares of olive trees, makes for a wonderfully relaxing day trip or longer stay outside of Marrakech. Have a grand time in the largest and most luminous suite in the Riad, featuring a luxuriously sized 2m bed, separate sitting room with fireplace, beautiful Menzeh to relax in whilst overlooking the courtyard and a luxurious bathroom opening out onto your own private terrace. We love pioneers and we love modernism, the Eileen Gray paying homage to both. This suite is made for lovers of design, featuring mid-century furniture and a reduced grey, white and red palette. The double shower and luxuriously sized bathtub make this a wonderful choice for lovers too! Relax whilst hearing the call to prayer, the sounds of the birds in the courtyard; this Suite makes you realize you are in Africa. The option of a double or two single beds make this ideal for children or friends sharing a holiday together and a wonderfully sized bathtub to while away in, makes for a relaxing stay. Named after the Beat Generation poet and painter Brion Gysin, an abstract painting from his Moroccan travels hangs on its walls. Smaller than the other suites and more masculine in style, due to its dark palette and strong design touches, The Gysin nevertheless feels inspiring and romantic as it overlooks both the courtyards below. ¨Pink is the navy blue of India¨ or so said Diana Vreeland, Vogue Editor and wonderfully eccentric taste-maker of the 20th Century. With this in mind, the room features an Indian headboard full of bright pink and flowers everywhere. Wake up to joyful colors, shower whilst looking out to the pink flowers of your private terrace and lounge in a separate bathtub before retuning to pink splendor. The smallest room in the house, this cozy corner overlooking the swimming pool is the perfect place for one person to disappear and read, write and while away in. Featuring a comfortably sized shower and blissful view of the courtyard below.